During the early days of radio, as in the early days of the internet, there was much scrambling done all around in order to figure out a way to make the technology profitable. When this article was on the newsstand the pioneers of radio were getting closer to achieving this goal but they were not there yet. 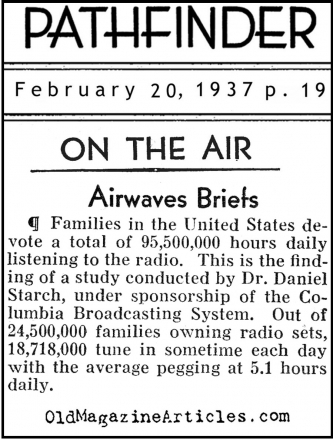 In Europe, by contrast, the concept of commercial radio was held askance by many; some nations barred all ads from "the invisible wave", while others preferred that commercials only be heard during certain hours of the day. "Educational broadcasting is growing in popularity in Europe and is being extended into the afternoon school hours." A good deal of column space explains how the Soviet Union used radio. 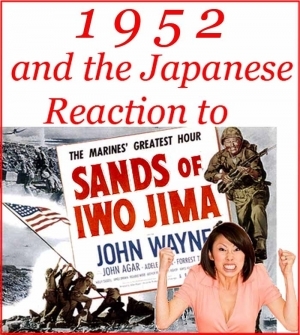 Read about the radio program that was produced by the WPA writers and actors branch in order to celebrate American diversity; click here. "Last month 'that upstart radio' sprang a surprise. Both national networks announced a boost in rates: ...25 percent"
The antisemitic radio ramblings of Father Charles Coughlin (1891 � 1979) prompted the brain trust of the nascent radio world to ponder deeply the differences between hate speech and free speech and where did their responsibilities rest in the matter. "Girding the United States today are two major national radio chains and one smaller chain. They are the National Broadcasting Company, the Columbia Broadcasting Company and the Mutual Broadcasting System, NBC, with its combined Red and Blue networks, has about 110 stations. CBS on a single network has 101. Mutual has 45 and will add a new section of 10 more next month." Here is a short profile of Irna Phillips (1901 - 1973) - she was, more than anyone else, the one who can be credited with the creation of the daytime dramas called "soap operas" on both radio and television. "At the age of 63, after 44 years in show business, and ten years as director of the Lux Radio Theater , Cecil B. De Mille is still producing. He can't stop and he probably never will. He is first, last and all the time a showman. The show business is in his blood, and whether he is on a set or taking his leisure at home, his heart and mind are in the theater. He loves to have people around him so that he can play a part, for consciously or unconsciously, he is always acting... C.B. 's father was an actor and playwright, and later a partner of David Belasco. His mother was an actress, and later a very successful play agent."